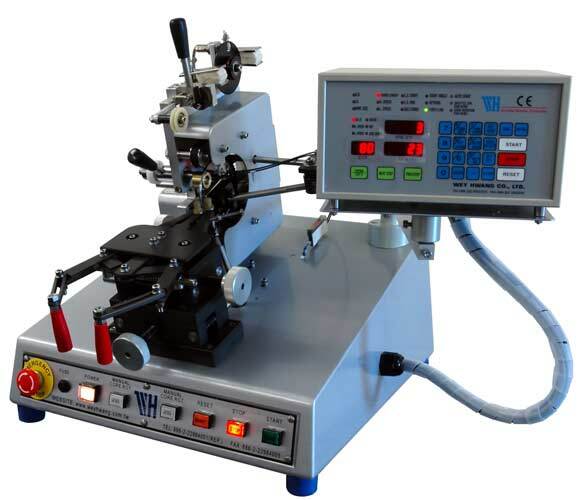 The WH-900 is a digitally controlled toroid winding machine, ideally suited to the manufacture of toroidal power transformers, isolation transformers, inductors, chokes, and other toroidal devices of up to 60mm finished outside diameter. The machine can be equipped with either 4 or 6 inch toroid winding heads, both of which are available in belt and side slider versions. The machine features automatic control over wire load length, running speed, acceleration and de-acceleration, etc, and programs for winding even the most complex toroids can be stored in memory for later use. The advanced fibre optic wire detection system includes a "teach-in" function for accurate and reliable turns count, even with coloured wires. The minimum finished Inside Diameter (I.D.) will vary according to shuttle size and coil height.